In a game where the results ultimately don’t matter, the Los Angeles Clippers sure didn’t play that way. 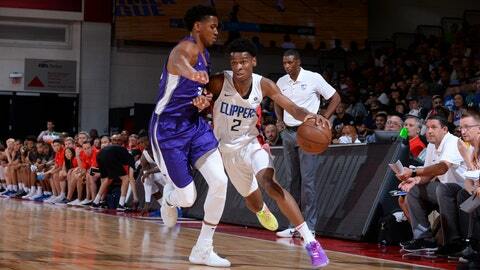 After battling to a tie through three quarters in the second Summer League game, the Clips played flawless 4th quarter team basketball to dominate the Sacramento Kings, eking out an 88-78 win that featured several prominent up-and-comers Sunday. As Jerome Robinson took a coach’s decision DNP, the ball was left in the trust-worthy hands of fellow lottery pick Shai Gilgeous-Alexander and returner Sindarius Thornwell… neither disappointed. SGA improved upon an already impressive appearance in his first Summer League game by posting 21 points on 8-of-16 shooting from the field. The savvy 6-foot-6 point guard also continued his status as a complete competitor by earning three steals on the defensive end. While Summer League action is a prominent time for rookies and new faces to gain some critical experience, it also allows younger returning players to gain leadership experience and enhance their game around peers: cue Thornwell. Sin City stayed true to his name by shinning under the Las Vegas lights, leading the Clippers in scoring for the second-straight game with 22 points on a more-than-respectable 7-of-12 from the field. Nine of those 22 came in clutch time during the 4th, proving vital as the Clips pulled away from the Kings by outscoring them 22-12 in the final quarter. Thornwell routinely found ways to separate himself from defenders and create open shots for himself and teammates, notching four assists to go along with his six rebounds. 📊 22p/6r/4a/1b | @Sin_City_803 led the Clippers with 22 points, including 9 in the fourth quarter. The Clips will be back in action for their third Summer League game against the Houston Rockets Monday at 8:30p.